These highlights do not include all the information needed to use Kit for the Preparation of Technetium Tc 99m Sulfur Colloid Injection. 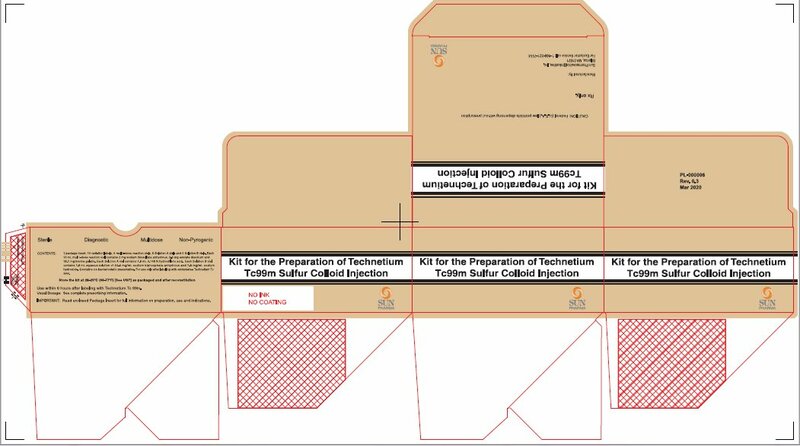 See full prescribing information for Kit for the Preparation of Technetium Tc 99m Sulfur Colloid Injection. Kit for the Preparation of Technetium Tc 99m Sulfur Colloid Injection for Subcutaneous, Intraperitoneal, Intravenous and Oral Use. • localization of lymph nodes draining a primary tumor in patients with breast cancer or malignant melanoma when used with a hand-held gamma counter. • evaluation of peritoneo-venous (LeVeen) shunt patency in adults. • imaging areas of functioning reticuloendothelial cells in the liver, spleen and bone marrow. • studies of esophageal transit and gastroesophageal reflux, and detection of pulmonary aspiration of gastric contents. Minimize Tc99m Sulfur Colloid radiation exposure and measure patient doses immediately before administration. • Breast cancer or malignant melanoma setting: by subcutaneous injection, 3.7 to 37 MBq (0.1 to 1 mCi in volumes ranging from 0.1 to 1 mL) ( 2.1). • by percutaneous transtubal injection: 12 to 37 MBq (0.3 to 1 mCi) in a volume not to exceed 0.5 mL. • Bone marrow imaging: 1.11 to 5.55 MBq (0.03 to 0.15 mCi) per kg of BW. • Pulmonary aspiration studies: 11.1 to 18.5 MBq (0.30 to 0.50 mCi). • 3.7 to 11.1 MBq (0.10 to 0.30 mCi). The Kit for the Preparation of Technetium Tc 99m Sulfur Colloid Injection is supplied as a package that contains 5 kits. Each kit contains three vials: one 10 mL multi-dose Reaction Vial, a Solution A vial and a Solution B vial. The vials contain the sterile non-pyrogenic, non-radioactive ingredients necessary to produce Technetium Tc 99m Sulfur Colloid Injection (3). Anaphylactic reactions including rare fatalities have occurred following intravenously administered Technetium Tc 99m Sulfur Colloid. Have resuscitation equipment and personnel immediately available (5.1). • evaluation of peritoneo-venous (LeVeen) shunt patency. • areas of functioning reticuloendothelial cells in the liver, spleen and bone marrow. • studies of esophageal transit and, gastroesophageal reflux, and detection of pulmonary aspiration of gastric contents. Technetium Tc 99m Sulfur Colloid Injection emits radiation. Use procedures to minimize radiation exposure. Measure patient dose by a suitable radioactivity calibration system immediately before administration. • Breast cancer or malignant melanoma setting in adults: 3.7 to 37 MBq (0.1 to 1 mCi) in volumes ranging from 0.1 to 1 mL by subcutaneous injection. • Peritoneo-venous (LeVeen) shunt setting in adults: 37 to 111 MBq (1 to 3 mCi) by intraperitoneal injection, or 12 to 37 MBq (0.3 to 1 mCi) in a volume not to exceed 0.5 mL by percutaneous transtubal (efferent limb) injection. Patient repositioning or other measures may be used to help assure uniform mixing of the radiopharmaceutical with peritoneal fluid. • bone marrow imaging: 111 to 444 MBq (3 to 12 mCi) by intravenous injection. • In pediatric patients: 3. • bone marrow imaging: 1.11 to 5.55 MBq (0.03 to 0.15 mCi) per kg of BW by intravenous injection. • pulmonary aspiration studies: 11.1 to 18.5 MBq (0.30 to 0.50 mCi) by oral administration. • In pediatric patients: 8. • gastroesophageal and pulmonary aspiration studies: 3.7 to 11.1 MBq (0.10 to 0.30 mCi) by oral or nasogastric tube administration. For oral administration, combine the radiopharmaceutical with a milk feeding. For nasogastric tube administration, administer the radiopharmaceutical into the stomach then instill a normal volume of dextrose or milk feeding. • The contents of the two Solution vials, the Solution A vial containing the appropriate acidic solution and the Solution B vial containing the appropriate buffer solution, are intended only for use in the preparation of the Technetium Tc 99m Sulfur Colloid Injection and are not to be directly administered to the patient. • Do not use Sodium Pertechnetate Tc 99m containing oxidants to reconstitute this kit. • The contents of the kit are not radioactive. However, after the Sodium Pertechnetate Tc 99m is added, maintain adequate shielding of the final preparation. Wear waterproof gloves during the preparation procedure. • Do not use Sodium Pertechnetate Tc 99m containing more than 10 micrograms per mL of aluminum ion because a flocculent precipitate may occur and such a precipitate may localize in the lung. • The contents of the kit are sterile and non-pyrogenic. This preparation contains no bacteriostatic preservative. Follow the directions carefully and adhere strictly to aseptic procedures during preparation. • Remove the dark brown plastic cap from the Sulfur Colloid multi-dose Reaction Vial and swab the top of the vial closure with alcohol to sterilize the surface. Complete the radiation label and affix to the vial. Place the vial in an appropriate lead-capped radiation shield labeled and identified. • With a sterile shielded syringe, aseptically obtain 1 to 3 mL of a suitable, oxidant-free sterile and non-pyrogenic Sodium Pertechnetate Tc 99m, each milliliter containing a maximum activity of 18,500 MBq (500 mCi). • Aseptically add the Sodium Pertechnetate Tc 99m to the vial. • Place a lead cover on the vial shield and dissolve the reagent by gentle swirling. • Just before use, remove the red cap from the Solution A vial and swab the top of the vial closure with alcohol to sterilize the surface. Using a sterile needle and syringe, aseptically withdraw 1.5 mL Solution A from the vial. Aseptically Inject 1.5mL Solution A into the multi-dose Reaction Vial and swirl again. • Transfer the multi-dose Reaction Vial from vial shield and place in a vigorously boiling water bath (water bath should be shielded with 1/8â€ to 1/4â€ lead) deep enough to cover the entire liquid contents of the vial. Keep the vial in the water bath for five minutes. • Remove the multi-dose Reaction Vial from the water bath and place in the lead shield and allow to cool for three minutes. Swab the vial closure again with an antiseptic. • Just before use, remove the blue cap from the Solution B vial and swab the top of the vial closure with alcohol to sterilize the surface. Using a sterile needle and syringe, aseptically withdraw 1.5 mL Solution B from the vial. Aseptically Inject 1.5 mL Solution B into the multi-dose Reaction Vial and swirl again. • Record time and date of preparation. • Allow the preparation to cool to body temperature before use. Maintain adequate shielding of the radioactive colloid preparation at all times. • Where appropriate, dilute the preparation with sterile Sodium Chloride Injection to bring the dosage to within the recommended range. • Mix the multi-dose Reaction Vial and aseptically withdraw material with a sterile shielded syringe for use within 6 hours of preparation. For optimum results this time should be minimized. The vial contains no bacteriostatic preservative. Store the reconstituted vial at 20 to 25°C (68 to77°F). Discard vial 6 hours after reconstitution. • Carefully agitate the shielded syringe immediately prior to administration of sulfur colloid to avoid particles aggregation and non-uniform distribution of radioactivity. Measure the patient dose by a suitable radioactivity calibration system immediately before administration. Check radiochemical purity before patient administration. Inspect Technetium Tc 99m Sulfur Colloid Injection visually for particulate matter and discoloration before administration, whenever solution and container permit. Do not administer the drug if it contains particulate matter or discoloration; dispose of these unacceptable or unused preparations in a safe manner, in compliance with applicable regulations. J Nucl Med, 23: 698-705, 1982. 3from Age-dependent â€œSâ€ values of Henrichs et al, Berlin 1982, except for the 1-year old. 3.from Age-dependent â€œSâ€ values of Henrichs et al., Berlin 1982, except for the 1-year old. Assumptions: Calculations for the absorbed radiation dose are based upon an effective half-time of 3 hours for the open shunt and 6.02 hours for the closed shunt and an even distribution of the radiopharmaceutical in the peritoneal cavity with no biological clearance. • In clinical studies, patients received injection of Technetium Tc 99m Sulfur Colloid Injection and a concomitant blue dye tracer in order to enhance the ability to detect lymph nodes. Visual inspection was performed to identify the blue-labeled nodes and a hand held gamma counter was used to identify nodes concentrating the radiopharmaceutical. Multiple methods were used to detect the concentrated radioactivity within lymph nodes. For example, investigators used thresholds of background radioactivity to localize nodes containing a minimum of radioactive counts 3 times higher than the background or containing at least 10 fold higher counts than contiguous nodes . • Peritoneo-venous (LeVeen) shunt setting in adults: Following administration of Technetium Tc 99m Sulfur Colloid Injection into the peritoneal cavity, the radiopharmaceutical mixes with the peritoneal fluid. Clearance from the peritoneal cavity varies from insignificant, which may occur with complete shunt blockage, to very rapid clearance with subsequent transfer into the systemic circulation when the shunt is patent. Following transfer into the systemic circulation, the radiopharmaceutical concentrates within the liver (a target organ). Obtain serial images of both the shunt and liver. An adequate evaluation of the difference between total blockage of the shunt and partial blockage may not be feasible in all cases. Transperitoneal absorption of sulfur colloid into the systemic circulation may occur, but it occurs slowly. Therefore, the most definitive scintigraphic evaluation of shunt patency will generally be obtained if there is visualization of both the shunt itself and the liver and/or spleen within the first three hours post intraperitoneal injection of the radiopharmaceutical. • Imaging areas of functioning reticuloendothelial cells in liver, spleen or bone marrow: Altered biodistribution with lung and soft tissue uptake instead of reticuloendothelial system has been reported after intravenous injection. The size and physical-chemical properties of the sulfur colloid particles formed from the components of the kit may determine the biodistribution of the colloid and its uptake by the reticuloendothelial system. Diseases affecting the reticuloendothelial system may also alter the expected uptake pattern. • Gastroesophageal and pulmonary aspiration imaging studies: To facilitate the imaging of gastroesophageal reflux consider administering Sulfur Colloid by nasogastric tube. Kit for the Preparation of Technetium Tc 99m Sulfur Colloid Injection is supplied in a package that contains 5 kits. All components of a kit are sterile and non-pyrogenic. Each 10mL multi-dose Reaction Vial contains, in lyophilized form, 2 mg sodium thiosulfate anhydrous, 2.3 mg edetate disodium and 18.1 mg bovine gelatin; each Solution A vial contains 1.8 mL 0.148 N hydrochloric acid solution and each Solution B vial contains 1.8 mL aqueous solution of 24.6 mg/mL sodium biphosphate anhydrous and 7.9 mg/mL sodium hydroxide. Included in each 5-kit package are one package insert and 10 radiation labels. Anaphylactic reactions with bronchospasm, hypotension, urticaria and rare fatalities have occurred following intravenously administered Technetium Tc 99m Sulfur Colloid Injection. Have emergency resuscitation equipment and personnel immediately available. Radiation-emitting products, including Technetium Tc 99m Sulfur Colloid Injection, may increase the risk for cancer, especially in pediatric patients. Use the smallest dose necessary for imaging and ensure safe handling to protect the patient and health care worker. [see Dosage and Administration (2.3)]. The most frequently reported adverse reactions, across all categories of use and routes of administration, include rash, allergic reaction, urticaria, anaphylaxis/anaphylactic shock, and hypotension. Less frequently reported adverse reactions are fatal cardiopulmonary arrest, seizures, dyspnea, bronchospasm, abdominal pain, flushing, nausea, vomiting, itching, fever, chills, perspiration, numbness, and dizziness. Local injection site reactions, including burning, blanching, erythema, sclerosis, swelling, eschar, and scarring, have also been reported. Specific drug-drug interactions have not been studied. Pregnancy Category C: Technetium Tc 99m crosses the placenta. Among 14 infants born to pregnant patients exposed to Technetium Tc 99m Sulfur Colloid Injection for lymph node localization, no birth defects were reported following drug exposure. Animal reproduction studies have not been conducted with Technetium Tc 99m Sulfur Colloid Injection. Technetium Tc 99m Sulfur Colloid Injection should be given to a pregnant woman only if clearly needed. All radiopharmaceuticals, including Technetium Tc 99m Sulfur Colloid Injection, have a potential to cause fetal harm. The likelihood of fetal harm depends on the stage of fetal development and the magnitude of the radiopharmaceutical dose. Assess pregnancy status before administering Technetium Tc 99m Sulfur Colloid Injection to a female of reproductive potential. Technetium Tc 99m is excreted in human milk during lactation. If nursing, patients should express and discard milk for a minimum of 6 hours after administration of Technetium Tc 99m Sulfur Colloid Injection. Following higher dose procedures [greater than 370 MBq (10 mCi)], patients should minimize close contact with infants for 6 hours after receiving a Technetium Tc 99m Sulfur Colloid Injection. The safety and efficacy of Technetium Tc 99m Sulfur Colloid kit in pediatric patients has been shown for the following indications: liver, spleen, and bone marrow imaging, and gastroesophageal and pulmonary aspiration studies. Clinical studies of Kit for the Preparation of Technetium Tc 99m Sulfur Colloid Injection did not include sufficient numbers of subjects aged 65 and over to determine whether they respond differently from younger subjects. In Females of reproductive potential, imaging procedures with Technetium Tc 99m Sulfur Colloid injection should be performed within ten days following the onset of menses or a pregnancy test should be performed within 48 hours of the procedure. The clinical consequences of overdosing with Technetium Tc 99m Sulfur Colloid Injection are not known. Kit for the Preparation of Technetium Tc 99m Sulfur Colloid Injection contains a multi-dose Reaction Vial, a Solution A vial and a Solution B vial which contain the sterile non-pyrogenic, non-radioactive ingredients necessary to produce Technetium Tc 99m Sulfur Colloid Injection for diagnostic use by subcutaneous, intraperitoneal, or intravenous injection or by oral administration. Each 10 mL multi-dose Reaction Vial contains, in lyophilized form 2 mg sodium thiosulfate anhydrous, 2.3 mg edetate disodium and 18.1 mg bovine gelatin; a Solution A vial contains 1.8 mL of 0.148 N hydrochloric acid solution and a Solution B vial contains 1.8 mL aqueous solution of 24.6 mg/mL sodium biphosphate anhydrous and 7.9 mg/mL sodium hydroxide. When a solution of sterile and non-pyrogenic Sodium Pertechnetate Tc 99m Injection in isotonic saline is mixed with these components, following the instructions provided with the kit, Technetium Tc 99m Sulfur Colloid Injection is formed. The product is intended for subcutaneous, intraperitoneal, or intravenous injection or for oral administration. The precise structure of Technetium Tc 99m Sulfur Colloid Injection is not known at this time. Technetium Tc 99m decays by isomeric transition with a physical half-life of 6.02 hours.4 The principal photon that is useful for detection and imaging studies is listed in Table 7. The specific gamma ray constant for Tc 99m is 0.78 R/millicurie-hr at 1cm. The first half-value layer is 0.017 cm of lead (Pb). A range of values for the relative attenuation of the radiation emitted by this radionuclide that results from interposition of various thicknesses of Pb is shown in Table 8. For example, the use of a 0.25 cm thickness of Pb will attenuate the radiation emitted by a factor of about 1,000. To correct for physical decay of this radionuclide, the fractions that remain at selected intervals after the time of calibration are shown in Table 9. Following intraperitoneal injection, Technetium Tc 99m Sulfur Colloid mixes with the peritoneal fluid; rate of clearance from the cavity allows assessment of the patency of the shunt. Clearance varies from insignificant, which may occur with complete shunt blockage, to very rapid clearance with subsequent transfer into the systemic circulation when the shunt is patent. Following intravenous injection, Technetium Tc 99m Sulfur Colloid is taken up by the reticuloendothelial system (RES), allowing RES rich structures to be imaged. With oral administration, Technetium Tc 99m Sulfur Colloid is not absorbed accounting for its function in esophageal transit studies, gastroesophageal reflux scintigraphy, and for the detection of pulmonary aspiration of gastric contents. Following intravenous administration, Technetium Tc 99m Sulfur Colloid Injection is rapidly cleared from the blood by the reticuloendothelial system with a nominal half-life of approximately 2 1/2 minutes. Uptake of the radioactive colloid by organs of the RES is dependent upon both their relative blood flow rates and the functional capacity of the phagocytic cells. In the average patient 80 to 90% of the injected collodial particles are phagocytized by the Kupffer cells of the liver, 5 to 10% by the spleen and the balance by the bone marrow. 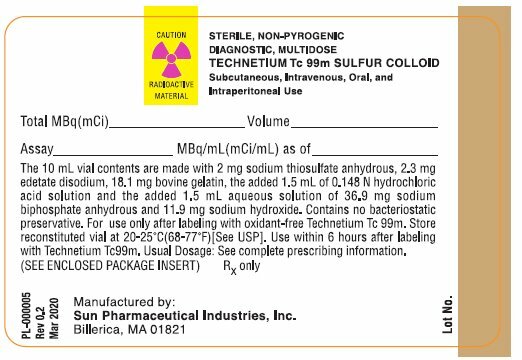 Following oral ingestion, Technetium Tc 99m Sulfur Colloid is distributed primarily through the gastrointestinal tract with elimination primarily through the feces. Animal studies to evaluate the carcinogenicity, mutagenesis, or reproductive toxicity potentials of Technetium Tc 99m Sulfur Colloid have not been conducted. A systematic review of 43 publications examined procedures that used the injection of Technetium Tc 99m Sulfur Colloid Injection and a blue dye (tracers) to assist surgeons in the localization of lymph nodes among patients with a primary breast cancer lesion. From these publications, 15 studies were identified for inclusion within a meta-analysis, based upon the following criteria: prospective design, minimum number of 50 lymph node localization procedures, and paired outcome data available for both Technetium Tc 99m Sulfur Colloid Injection and blue dye. Within these studies, the number of procedures ranged from 62 to 6,197; in general one procedure involved a single patient but in some uncommon situations, one patient underwent more than one procedure. The patients received subcutaneous Technetium Tc 99m Sulfur Colloid Injection doses ranging between 0.1 and 2 mCi. The mean age of patients ranged from 52 to 60 years, and almost all were female. Lymph nodes that contained radioactivity were generally localized based upon increased counts, in comparison to a background threshold (e.g., nodes containing a minimum of radioactive counts 3 times higher than background or containing at least 10 fold higher counts than contiguous nodes). Radioactivity was measured using a handheld gamma counter. * Percentage of procedures in which at least one lymph node contained the specific tracer; the percents do not add to 100% due to rounding. In some of the publications, different methods of Technetium Tc 99m Sulfur Colloid Injection administration were compared: intradermal (ID), subareolar (SA) and intraparenchymal (IP) methods. Generally, more favorable results were seen using the ID and SA routes, with less favorable results reported when surgeons used the IP method. A systematic review of eight publications examined the use of Technetium Tc 99m Sulfur Colloid and a blue dye (tracers) to assist surgeons in the localization of lymph nodes among patients with malignant melanoma. A meta-analysis was performed using data from the studies that reported the resected lymph node content of Technetium Tc 99m Sulfur Colloid Injection and blue dye. Four of the eight publications met this criterion and were included in the meta-analysis. Within these four studies, the number of reported patients ranged from 12 to 94. The patients received subcutaneous Technetium Tc 99m Sulfur Colloid Injection doses ranging between 0.25 to 2 mCi. The patients were aged 15 to 89 years and most (53 to 70%) were male. Lymph nodes that contained radioactivity were generally localized based upon increased counts, in comparison to a background threshold (e.g., nodes containing a minimum of radioactive counts 3 times higher than background). Radioactivity was measured using a handheld gamma counter. * Percentage of patients in which at least one lymph node contained the specific tracer; the percents do not add to 100% due to rounding. ** 95% Confidence Intervals are based on meta-analysis and represent the spread in the individual estimates. • Bergqvist L, Strand S-E, Persson B, et al. Dosimetry in Lymphoscintigraphy of Tc 99m Antimony Sulfide Colloid, J Nucl Med., 23: 698-705, 1982. • Henrichs et al. Estimation of age-dependent internal dose from radiopharmaceuticals, Phys. Med. Biol., 27: 775-784, 1982. • Kocher DC: Radioactive decay data tables. DOE/TIC-11026: 108, 1981. Kit for the Preparation of Technetium Tc 99m Sulfur Colloid Injection is supplied in a package that contains 5 kits. All kit components are sterile and non-pyrogenic. Each 10mL multi-dose Reaction Vial contains, in lyophilized form, 2 mg sodium thiosulfate anhydrous, 2.3 mg edetate disodium and 18.1 mg bovine gelatin; each Solution A vial contains 1.8 mL 0.148 N hydrochloric acid solution and each Solution B vial contains 1.8 mL aqueous solution of 24.6 mg/mL sodium biphosphate anhydrous and 7.9 mg/mL sodium hydroxide. Included in each 5-kit package are one package insert and 10 radiation labels. Store the kit at 20-25°C (68-77°F) as packaged and after reconstitution. This reagent kit for preparation of a radiopharmaceutical is approved for use by persons licensed pursuant to Section 120.547, Code of Massachusetts Regulation 105, or under equivalent license to the U.S. Nuclear Regulatory Commission or an Agreement State. Inform patients they may experience a burning sensation at the injection site. Infor lactating patients that they should express and discard milk for a minimum of 6 hours following administration of Technetium Tc 99m Sulfur Colloid Injection. for use in the Preparation of Technetium Tc 99m Sulfur Colloid Injection. Each 10mL reaction vial contains in lyophilized form 2.0 mg sodium thiosulfate anhydrous, 2.3 mg edetate disodium and 18.1 mg bovine gelatin. Usual Dosage: See complete prescribing information. (68-77°F) [See USP] as packaged and after reconstitution with Technetium Tc 99m. Use within 6 hours after reconstitution. Solution A vial contains 1.8mL sterile, non pyrogenic 0.148 N hydrochloric acid solution. 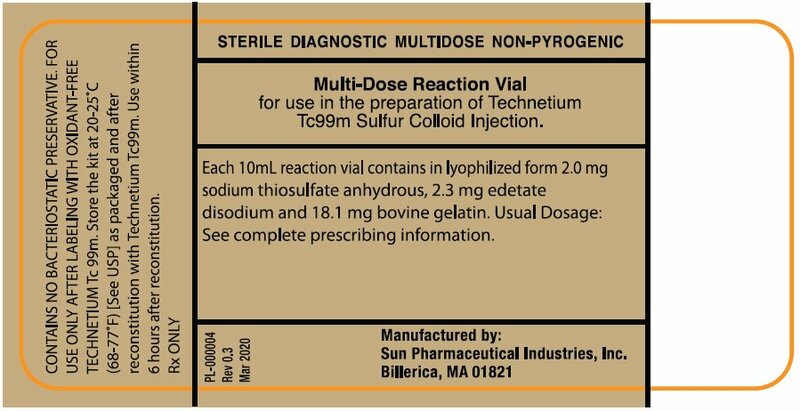 To be used only with the Sulfur Colloid Multi-dose Reaction Vial. NOT FOR DIRECT INTRAVENOUS INJECTION. 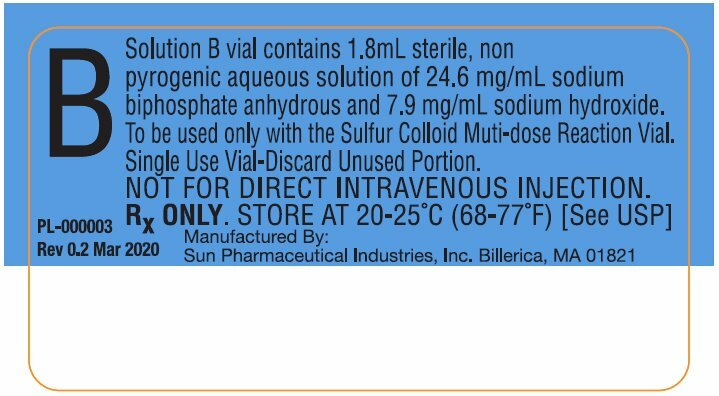 Solution B vial contains 1.8mL sterile, non pyrogenic aqueous solution of 24.6 mg/mL sodium biphosphate anhydrous and 7.9 mg/mL sodium hydroxide. To be used only with the Sulfur Colloid Multi-dose Reaction Vial. 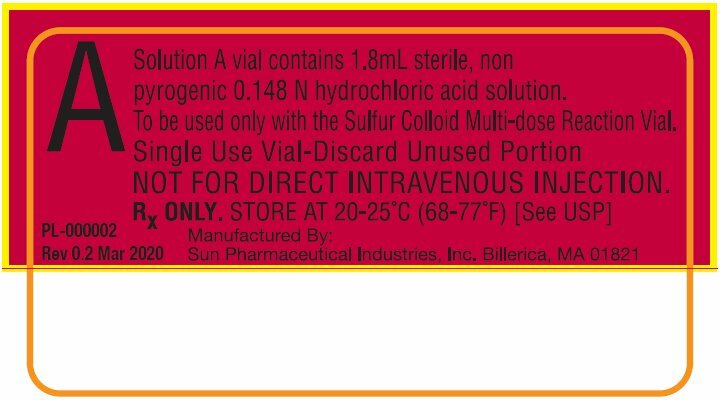 Single Use Vial-Discard Unused Portion. CONTENTS: 1 package insert, 10 radiation labels, 5 multi-dose reaction vials, 5 Solution A vials and 5 Solution B vials. Each 10 mL multi-dose reaction vial contains 2 mg sodium thiosulfate anhydrous, 2.3 mg edetate disodium and 18.1 mg bovine gelatin. Each Solution A vial contains 1.8 mL 0.148 N hydrochloric acid. Each solution B vial contains 1.8 mL aqueous solution of 24.6 mg/mL sodium biphosphate anhydrous and 7.9 mg/mL sodium hydroxide. Contains no bacteriostatic preservative. For intravenous use only after labeling with oxidant-free Technetium Tc 99m. Use within 6 hours after labeling with Technetium Tc 99m. Usual Dosage: See complete prescribing information. IMPORTANT: Read enclosed Package Insert for full information on preparation, use and indications.